Kansas City Fire Chief Paul Berardi identified the two firefighters killed in Monday night's blaze as Larry J. Leggio and John V. Mesh. The firefighters were pronounced dead at Truman Medical Center after a burning apartment building on Independence Avenue collapsed. Two other firefighters were injured. One has been released. The other is expected to be released today, Berardi said. At a news conference Tuesday morning fire officials said the building was nearly a block long and federal investigators would be assisting the Kansas City fire department in determining the cause. Kansas City firefighters were still putting out hot spots at 10 a.m. Tuesday in the Historic Northeast, where two firefighters perished in a building collapse the night before. "It didn't fall like a normal collapse," Berardi told reporters. "It was actually pushed out." Berardi also told reporters there would be counseling services for the families of the firefighters killed. "Unfortunately," he said, "this is one thing we know how to do." Two Kansas City, Missouri firefighters died last night in a massive fire and building collapse near Independence Avenue and Prospect. Two other firefighters were reported injured. The firefighters were injured when a wall of the building collapsed, moments after firefighters had declared the structure unstable and began clearing the area. A somber Fire Chief Paul Berardi said the immediate families of the victims had been notified and that the families of the two injured firefighters had gone to the hospital to which the two were taken. But he said some family members had not yet been notified and that the names of the dead and injured would not likely be released to the public until a 7 a.m. Tuesday news conference. Berardi commented, “It is a time for grieving,” adding that the fire department would offer all possible assistance to the families of the victims and work to console fellow firefighters who lived and worked with them. The building that burned housed several businesses on the first floor with apartments on the second floor. After the partial collapse, the fire department shifted to “defensive mode,” which basically means to let the building burn and concentrate on preventing the spread of the fire to other structures. 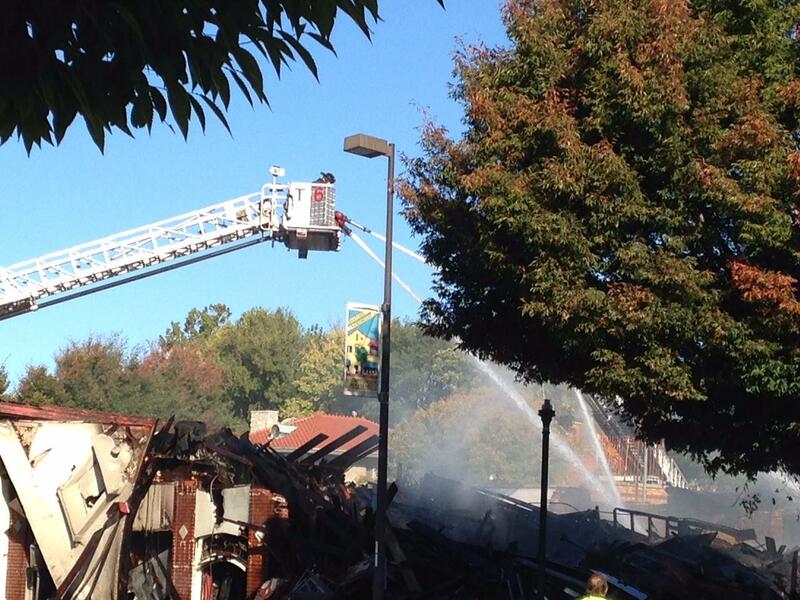 Residents of the apartments reportedly lost all of their belongings. Fire officials and agents of the Bureau of Alcohol, Tobacco, Firearms and Explosives are expected to begin an investigation of the cause of the fire as soon as it is safe to do so.